Vicinities, as a unique TV format both in its idea, realisation and scope continues to grow and now it will enter its fifth season. The start of the shooting of the first six episodes of this regional initiative of the European Fund for the Balkans and the Centre for Democracy and Reconciliation in Southeast Europe is scheduled for June 2, 2016. The list of new topics that will be tackled through the show will open with the episode titled as “(Mis)trust among the Neighbours” with introductory remarks by Enver Kazaz (Professor at the Faculty of Philosophy in Sarajevo, Bosnia and Herzegovina) and the guests in the studio: Slobodanka Broz (Author, Bosnia and Herzegovina), Vladimir Pistalo (Writer, Serbia), Arian Leka (Contemporary Writer, Albania), Jadran Kapor (Journalist, Croatia). The following episode “Are We a Target?” will be focused on the omnipresent fear of the terroristic attacks with the guests: Zlatko Dizdarevic (Journalist, Serbia) , Suad Misini (Policy Analyst and Media Expert), Arjan Dyrmishi (Head of the Centre for European and Security in the Institute for Democracy and Mediation, Albania), and Marija Djoric (Professor assistant at European Faculty of Low and Political Sciences, University Singidunum, Serbia). The following episodes “Bilateral Disputes”, “Over Indebtedness of the Countries and the Citizens”, “Shrinking Demographics (Depopulation)”, Tabloid(iot)isation of the Public Life” will conclude the first phase of the production of the fifth season, with six more episodes coming up in September. A significant number of representatives of the European Fund for the Balkans community network will be once again included in all the discussions as active participating audience, which will additionally strengthen the regional dimension of this traditionally supported initiative. 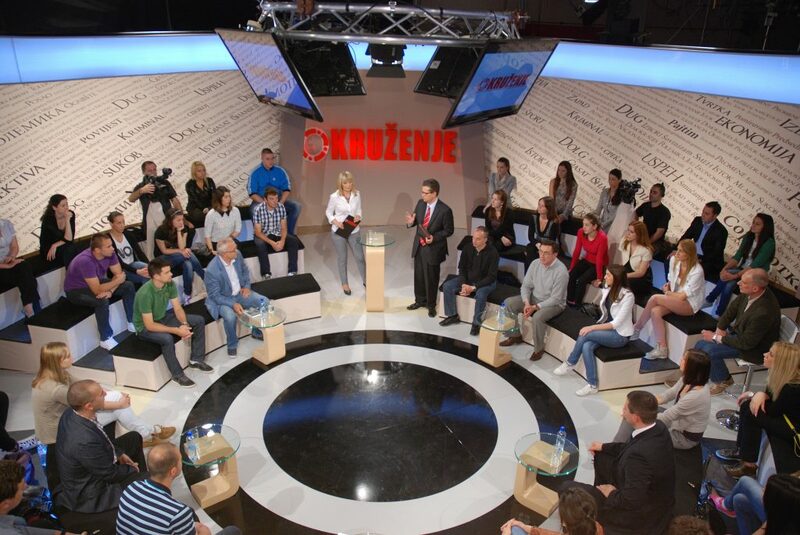 The fifth season of “Vicinities” will be broadcasted in the autumn programme schedule at the following TV stations with national public broadcasting licences – HRT 4 (Croatia), RTS 2 (Serbia), RTSH (Albania), BHRT (Bosnia and Herzegovina), TVBN (Bosnia and Herzegovina), RTV 3 (Slovenia), TV Vijesti (Montenegro), TV Alsat (Macedonia), RTK 1(Kosovo) and RTK 2 (Kosovo), as well as numerous local stations in Serbia.